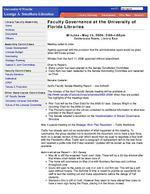 Library Faculty Assembly Home Archives Documents Officers Assembly Committees Career Development Libraries Budget Nominating Strategic Planning Special & Joint Committees Faculty Committees Faculty Senators Sabbatical SPEP Tenure & Promotion Other Governance Committees UF Faculty Senate University Libraries Committee Future of the Libraries Committee myUFL login required Library Catalog Databases Site Map SearchFaculty Governance at the University of Florida LibrariesMinutes May 15, 2006: 2:00-4:00pmConference Room, Library East Meeting called to order Agenda approved with the provision that the administrative report would be given when Bill Covey arrived. Minutes from the April 17, 2006 approved without amendment.Chair's Report: Blake Landor has been elected to the Senate Constitution Committee Carol Kem has been reelected to the Senate Nominating Committee and reelected as ChairSenate Update:April's Faculty Senate Meeting Report -Joe Aufmuth The minutes of the April Faculty Senate meeting will be available at http://www.senate.ufl.edu/archives/schedules/2005-2006/ when they are posted. The highlights of the meetings were Rick Yost will be the Chair Elect for the 2006-07 year. Danaya Wright is the incoming Chair for the 2006-07 year. The Provost's report on the Library contained no additional information to what was provided in the March report. The Senate adopted a resolution on the Implementation of Shared Governance Structure May 4 special meeting on the Strategic Work Plan Resolution -Cathy Martiniyak Cathy has already sent out an explanation of what happened at this meeting. To summarize: the group decided not to wordsmith the document, but to have a task force work on a senate version of the plan which would then be used to negotiate a final draft with the President's office. Cathy sent a paragraph of replacement text to the task force and received a polite note that it was received. Updates will be issued as they are made available.Administrative Report -Bill Covey May 26 is still the expected "hand-over" date. There will be a 30-day window after that where small details will be taken care of. The move will commence on May 31st with Business Services and continue throughout June Doors will open to the public on July 3 or July 5--not firm yet. This will be a soft open without hoopla. The Summer B time is meant to provide an opportunity for staff to test the building out and make adjustments before the deluge of Fall students. Starbucks (tm) is still on hold. However they seem to have altered their plans to have a neon sign facing the Plaza, placing it in the library instead.